This function allows the users to provide details of the page that will be used to enter all disbursement made to students by both the overseas education attaché and the scholarship section depending on who made the payments. Roles Involve: MOE Scholarship Section - Finance Officer, Finance Clerk, Administrator, Verifier (view) & Scholarship Officer (view). Navigate to Main Menu> Student Financials > Scholarship and Bursaries > Scholarship Disbursement. Select MOE01 from the prompt box to enter it into the Academic Institution field and enter the Student ID. Note: Click on the magnifying glass symbol next to the Academic Institution field to initiate a prompt and enter the Student ID. After that, click the Add button to create new entry. 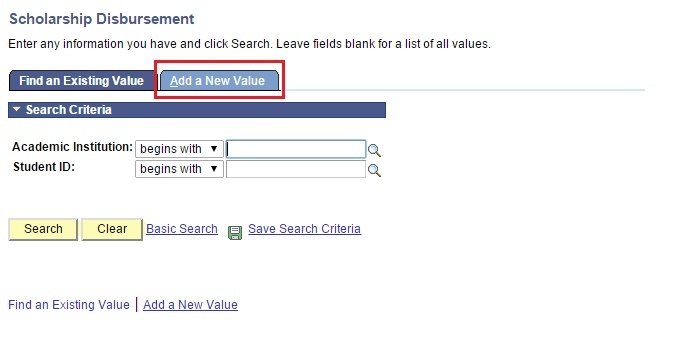 In this page, user should enter the given information into the field. Enter data into required fields such as Month, Year, Payment made from and Payment Made to. 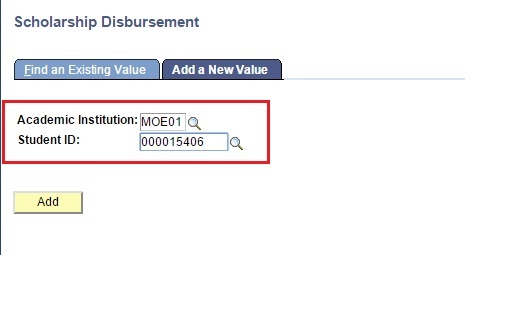 Enter the data into the relevant required fields such as Payment Category, Payment Type, Amount. Click on the + button to add another row. Enter the data into the remaining fields. Click Save button to save the entry.